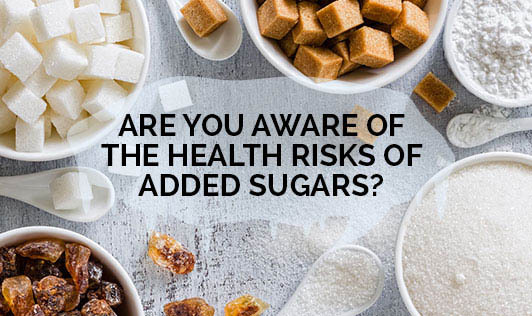 Are you Aware Of The Health Risks Of Added Sugars? Sugar is a necessary component to human life; your cells use sugar to create the energy your body needs to perform its daily functions. But as most of us know intuitively that added sugar above the recommendation is bad for health. There is a real big difference between added sugars and naturally occurring sugars. Added sugars are those added to food by consumers or during manufacturing by food producers. This might cause health risks on a long run that are listed below. Increase the risk of Coronary heart disease - Eating an excessive amount of added sugar can increase triglyceride levels, LDL levels which may increase your risk of heart disease. Promote tooth decay - All forms of sugar promote tooth decay by allowing the bacteria to grow. The more likely you are to develop cavities, especially if you don't practice a good oral hygiene. Contribute to weight gain. There's usually no single cause for being overweight or obese. But added sugar is likely to contribute to the problem as it adds calories to food and beverages making them more calorie-dense. Increase the risk of Diabetes - The sugar you consume ends up in the bloodstream and are transported to your cells by insulin. Consuming copious amounts of sugar over time can lead to type 2 diabetes, where your body does not respond properly to the insulin it secretes into your bloodstream. Suppress your immune system - The results of a study published in the American Journal of Clinical Nutrition (AJCN) demonstrates that the amount of sugar in sweetened beverages lowers immune response by 50% for up to five hours after drinking or eating. The key is moderation, so stick to naturally occurring sugar that is found in fruit. This also means, you can save to miss out on important nutrients, vitamins and minerals!